Home / Civilian and corporate insignia, pins, badges, etc. / Insignia, police, fire brigade, customs, etc... / Gasmask Kemira M/71, Finnish CD, w/ bag, unissued. 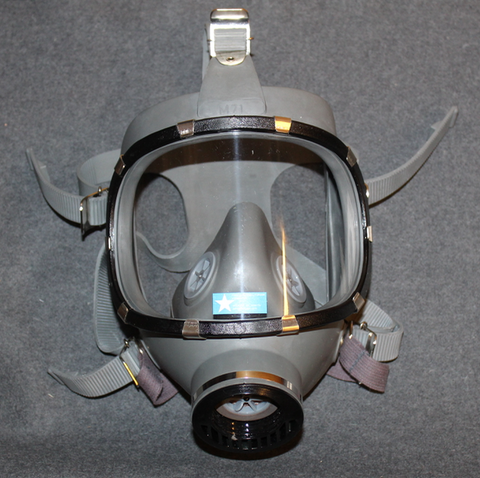 Old civil defense surplus gasmask, robust construction, made from gray rubber. These were made in Finland for military and CD use, at some point most cities had large Fallout shelters full of equipment in anticipation of coming nuclear holocaust. The masks are stored in plastic bags, and in a canvas bag with strap, it is quite fair to say these are unissued, the thread of filter is 40mm, which is still in use. The masks are sold for collector purposes only, the use of mask is strictly prohibited, hastur.fi claims no responsibility of anything if mask is worn or used. The mask is packed in canvas pouch. The mask may or may not be in perfect condition, the long storage time, and other handling may have caused damage to the mask, even if it can not be seen on bare eyes. Made to survive a nuclear war, very hard to break. If you do not wish to own the bag, please notify us, we can ship the mask without it. This kind of equipment may be illegal in your country, please consult local authorities before purchase.